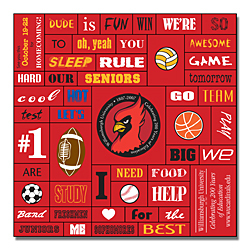 An impressive 5.5x5.5 school magna phrase full color magnet can be utilized for promotional purposes. This magnet can be customized with sports information and brand information against the payment of $0.43. The advertisers can choose to promote the spirit of their school team and their brand through this magnet. Advertisers can avail discounts on bulk purchasing and also they don’t have to pay shipping charges! Product Size: 5.5 in. x 5.5 in.